Imagine sitting around the house with family and friends. It’s game night, and you pull out the latest and greatest game. To promote the wholesomeness of the evening, the game will have to be something with good values. It should not use profanity.It will promote healthy competition. Most importantly, the game will be fun. In that case, what could be more fitting than one that is both fun but also teaches a lesson? Using charming cartoon-drawn cards, the game is sure to be a crowd pleaser. Without further ado, you present all assembled with Pharisees: The Party Game. Pharisees boasts all the excitement of Settlers of Catan, the educational value of Pandemic, and the antisemitism of Mein Kampf. Your family and guests are in for a thrill. Although, one might wish that this was satire, it is not. 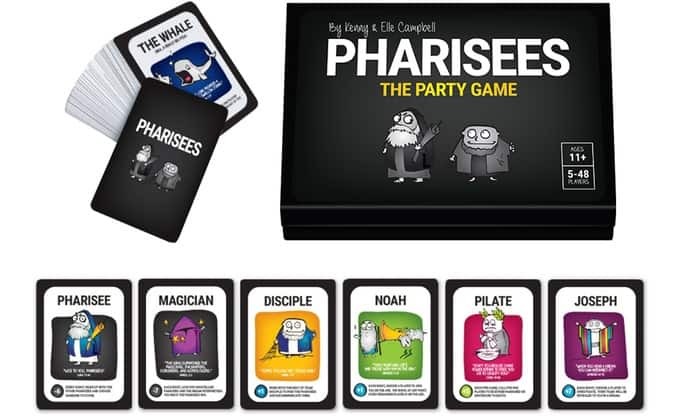 Pharisees: The Party Game is available for immediate purchase on Amazon. Pharisees is the brainchild of Kenny and Elle Campbell, a young couple, former ministers, and their company called Stuff You Can Use. Their website and blog posts indicate that the Campbells have produced a wide variety of materials and curricula for Christian youth. They appear wholesome and excited. Unfortunately, it’s not clear if they know that what they are producing touches upon classic antisemitic tropes. While Pharisees is based on the popular Apostrophe game, Mafia, and its more magical sister game, Werewolf, Pharisees has a more biblical twist. Created in 1986 by Dmitry Davidoff, Mafia models a battle between members of the mob and the innocent majority of good citizens. Filled with secret assassinations and nighttime plots to take over the world, Mafia enables players to take a walk on the Mob’s wild side. Like in Mafia, the evil Pharisees, set out to “stone” unsuspecting innocents each and every evening. In conspiracy with the “snake,” the Pharisees pick characters such as the Disciples or biblical prophets like Moses or Joseph to “stone” to death. The main character to be stoned is Jesus. Unlike other characters, however, Jesus comes back to life after “being dead” for three rounds of gameplay. The Pharisees slowly try to take over the world by killing off as many innocents as possible. Working with evil doers such as Judas or Pontius Pilate, the Pharisees aim to destroy the ministry of Jesus. Meanwhile, the “good guys”, who are most of the population, try to uncover the clandestine plots and excommunicate the evil doers before the Pharisees destroy all that is holy. The stated aim of the “party game”—beyond just having fun sneaking around as evil Pharisees killing everyone—is to teach the lessons of the Bible. Yet, I’m not sure which Bible they are teaching. One doesn’t get the sense from the New Testament that the Pharisees indiscriminately ran around stoning people. In addition, the game smashes together a bizarre mixture of biblical characters from the Hebrew and Christian scriptures. Figures who lived in different periods are presented as if they lived together: King David, Elisha, Noah, Daniel, Zekhariah, Pharaoh, Paul, Jesus, etc. One gets the feeling that the only educational message the game creators deem important enough to convey is that the Pharisees were murderers. Probably the most dangerous element in this entire travesty of history is it wasn’t Pontius Pilate who crucified Jesus, but rather the Pharisees who stoned him to death. In fact, Pilate is actually listed as a member of the good guys in the game since he can pardon as well as put to death. Thus the creators have authored a new and sinister narrative placing the blame of Jesus’s death squarely on the shoulders of the Pharisees. This is a serious accusation couched in a beautifully illustrated card game. Now let’s be clear, rabbinic Jews have always seen themselves as inheritors of the Pharisaic tradition. For centuries, the Church viewed the Jews as semi-demonic descendants of the Pharisees represented by the famous Ecclesia and Synagoga sculptures commonly appearing in Medieval Christian art. Of course, despite the Reformation, even parts of Protestantism inherited this anti-Jewish tradition. The equation made between the various games is clear: Werewolves = Mafiosos = Pharisees = Murderers. The goal of good society is to stop this combination from winning. Of course, the continued equation is a famous one: Pharisees = Rabbis = Jews. Haven’t we gotten beyond the danger of this type of message? Does the material honestly reflects present-day Christian Theology? Even if it does, does it truly reflect the text of the New Testament? What comes next? A medieval times expansion pack titled Matzah Baking? One can almost imagine the gameplay: cards for Jews who sacrifice Christian babies and others for Christians; one card can be for William of Norwich while others for Harold of Gloucester and Robert of Bury and Little Saint Hugh of Lincoln. I imagine that the Campbells didn’t mean to stoke the flames of classical antisemitism. Unfortunately, they did not respond to my attempts to contact them. Even in an age when Neo-Nazis can march in Charlottesville, Virginia, oddly proclaiming “Jews will not replace us,” most would not want to be linked to such vile messages and especially not in a kids’ game. Yet, what the authors of Jewish Annotated New Testament say about Paul applies here, as well: “This passage has implications for the emergence of anti-Judaism in the Christian tradition. If Paul wrote these words, then he is inextricably associated with the promulgation of anti-Judaism, regardless of his intentions” (p. 374 ). The Campbells’ game goes along with a narrative which is only one step away from medieval blood libels of Jews sneaking around at night killing innocent Christian children for their own nefarious purposes. Many may feel that a game is just a game. But consider this: one of the first objects on display at the entrance of Yad Vashem is the 1936 Nazi children’s game, Juden Raus. It’s a simple game, really, with an easy task. The first player to round up all six Jews—represented by pieces with pointed hats and snarling faces—and to send them out of Germany to Palestine wins. This, too, was just a kids’ game. Yet, it was as a brick in the wall of Nazi propaganda which led to Auschwitz. 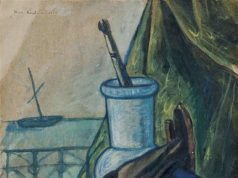 Juden Raus represented a concerted effort to impact the youth culture in Nazi Germany and to nurture hatred for the Jews in the minds and hearts of German children. The Germans could easily have taken a page out of the biblical book of Proverbs, “Teach a child according to his way, when he ages the instruction will not leave him” (22:6). My fear is that the game Pharisees will, knowingly or not, have the same effect. 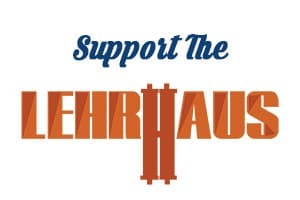 Given the toxic political culture in America today, this game, like its Nazi era precursor, could serve the role of instilling and maybe even reinforcing antisemitism. According to the ADL, since the latest presidential election, antisemitic attacks have spiked massively. This is a dangerous trend and one that must be reversed. This “party game” could add fuel to an already dangerous fire of Jew hatred. Perhaps it is time for the Pharisees: the Party Game’s creators and Amazon to rethink selling this particular game? Rabbi Todd Berman is the Associate Director at Yeshivat Eretz HaTzvi. He has held numerous posts in education from the high school level through adult education. 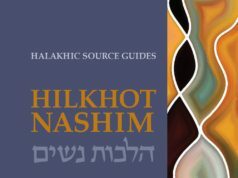 He founded the Jewish Learning Initiative (JLI) at Brandeis University and served as rabbinic advisor to the Orthodox community there for several years. Previously, he was a RaM at Midreshet Lindenbaum where he also served as the Rav of the dormitory.